We got into the habit of eating this dish regularly when I was fasting twice a week in my bid to lose weight using the 5:2 regime. It is a relatively simple dish that we all enjoy. 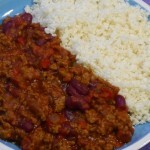 Initially, we ate a purely traditional beef mince version with one spicy and one mild pot of each. 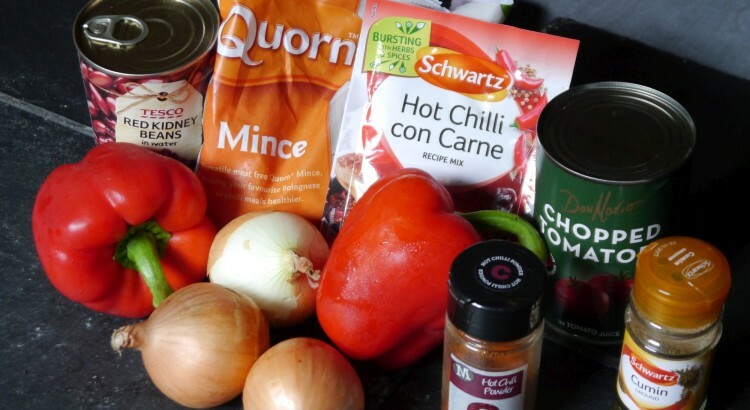 It was easy to switch to a meat and Quorn combination when the eldest, spice averse daughter became vegetarian, but by the time our youngest spice fiend followed suit, it all became a bit of a hassle. So, I switched to the hot/mild combo using only Quorn. At which point I realised I could eat a lot more of the non-meat variety on a fast day than I had hitherto been able to serve myself on those days when every calorie had to be weighed and counted. Served with a good helping of cauliflower rice (recipe at the end) you can enjoy a really satisfying bowl of this for as little as 230 calories. Bargain. The following quantities add up to around 1950 calories. A 265g portion (11th of total amount made) equates to 180 calories: obviously, on a normal daily intake you can enjoy double the quantity, or more if you're really hungry! Using 5% fat beef mince adds around 20 more calories to a 265g serving: 10% fat mince adds 55 calories. We usually serve it with wholegrain basmati rice, with a good few cubes of frozen chopped spinach thrown in for the last 5 minutes of the cooking time: really, you can’t taste it, but it adds another level of fibre and nutrients (including iron) to the meal. Instead of the spice mix you can make your own blend of salt, chilli powder and ground cumin (I would use around 4 tsp chilli and 2 tsp cumin for this quantity and maybe a little corn flour to thicken). Chop the onions and peppers before softening in a little FryLight. Once mixture is nice and juicy, separate into 2 different pans if going for a mild/hot or veggie/meatie split before adding appropriate spices and stirring through. Add tinned tomatoes and kidney beans and mix well. Then add chosen protein source: Quorn can be tipped in straight from the freezer, but I would recommend browning beef mince in a separate pan first. Simmer for 30 minutes for Quorn or 1 hour for beef. Simply split a cauliflower into florets and cut away as much of the flowery bit as possible: discard the stalks or save for a soup. 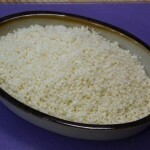 Finely chop by hand, or pulse in a blender until it resembles rice/couscous. Place in a microwaveable container, add a little salt and cook on high for 3 minutes. I don’t recommend cooking in boiling water as it becomes very water logged.